Whether you’re a working professional, full-time mom, a teacher or a diligent student, it’s easy to feel overwhelmed and pulled in a million directions. Created by designer Whitney English, Day Designer for Blue Sky is a simple and easy system created to help you find balance, focus and productivity. This planner isn’t magic and it can’t live your life for you. But it can, through a simple, guided framework, help you figure out a focus for intentional living. It can be a trusted tool for setting goals, creating a plan and taking action each and every day. This exceptionally built planner exudes quality, design elements and inspired productivity in one well-organized ensemble. It will teach and guide you with a clear path and directions to organize your day, your tasks, assignments, to-do’s and achieve your goals. This academic planner is ideal for teachers, professors, administrators, students or anyone involved in education. 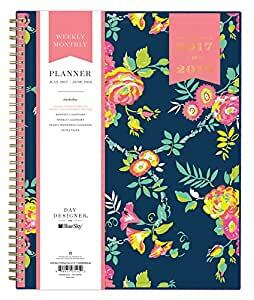 You will feel more organized and in charge of your hectic schedule, while carrying this harmoniously built Day Designer for Blue Sky academic planner. It will also make a subtle fashion statement with friends and peers around you. A well-designed day is a well-lived life!